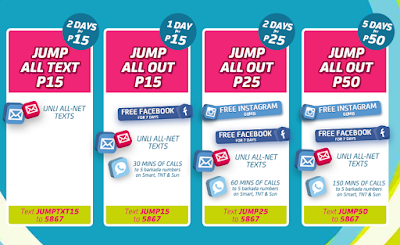 As of September 2015 Smart Jump In added more options to their subscribers in registering call and text promos. From previous Jump All Out 15 and All Text 15, they now added more free service like Facebook and Instagram. With the same amount of load credit on your account you can register to same Jump In SIM promos plus free bundles of social networking sites access. You can also avail Jump All Out 25, which gives your free 60mb of Instagram, Facebook, All net texts and 60 minutes calls to 5 numbers. To register just text JUMP25 to 5867 with 2 days validity period for only 25 pesos. That’s it for now guys, hope it helps you. Feel free to share this info to your friends. Tapos na ang promo ng Jumpbig15 niLa ,, dapat hindi nila tinangal sana ibalik ulit yun lang lagi ko nireregister ehh ,, kesa sa jumpytxt for 2days lang bihira lang nmn kasi aq mag txt..